Fleet Foxes’ freshman effort is smooth and organic. But it has something that a lot of modern folk bands don’t have– pop accessibility and a story to tell. It’s atmospheric in an escapist sort of way. You listen to tracks like the opener “Sun It Rises,” and you’re lifted into a dewy mountain range. It’s both really relaxing but also lively and constantly shifting. The lyrics seem to describe a couple who find and adopt a baby named Oliver James, who they find in a cradle floating in the river. I think the first time I listened to the album, I listened to “Oliver James” on repeat for several plays. It’s tranquil with its river imagery, but it will do anything but put you to sleep. We were trying to figure out what we wanted to do, and my brother had been working out some stuff, when I saw that Bruegel painting in a book my girlfriend had. I liked that it had a really intriguing meaning, like there’s a story to each little scene. Which I just felt fitting for that record- dense but unified, not a collage or anything. And I liked its Where’s Waldo? quality, that it was something you could look at for a long time on a vinyl sleeve and find new little things. 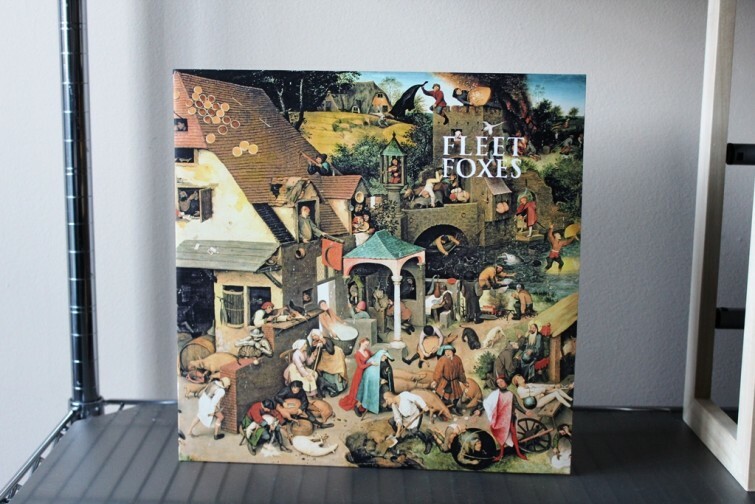 For that reason, “Fleet Foxes” should be displayed on the wall– rather than stuffed in a record crate. Like Bon Iver, it seems the gentlemen of Fleet Foxes craft songs around cathartic isolation (even if that probably isn’t the case). Each song seems to tell as story, even if the narrative isn’t always clear. It feels like each tune was written in a unique landscape. And “Fleet Foxes” has incredible range in its 11 tracks, rising and falling with a capella waves and acoustic strings, keyboard, flute and soft percussion. Fans of Iron and Wine, Band of Horses and The National should all find something to love in this indie classic. Not only did the Seattle-based folk-rockers release one of the best albums of 2008, they also followed it up with an equally majestic album in 2011. “Fleet Foxes” is best listened to in a log cabin in the mountains with a smooth blended scotch. And as always, I recommend this album be spun its vinyl glory.